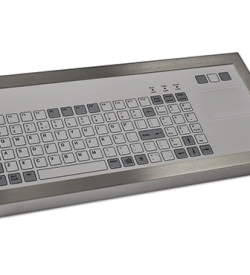 With a >1 million operation switches expectancy, the 128T series keyboard with 50mm (2”) trackerball also offers embossed keys for enhanced feel and alternative mounting. Industrial operations need precise coordination and require computing devices with a responsive peripheral device. It must remain functional throughout the entire procedure. 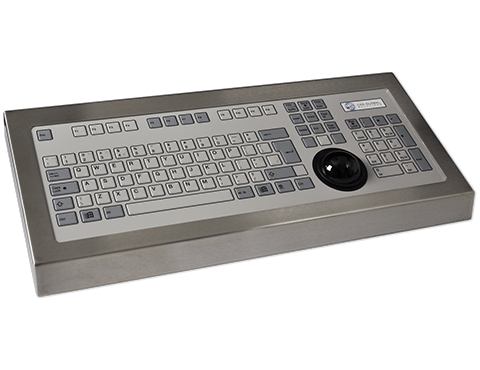 As a result, integrating our 128-key industrial keyboard with trackerball is the ideal solution. It features a wear and chemical resistant overlay which prevents outdoor exposure and chemical spills from damaging the keys. 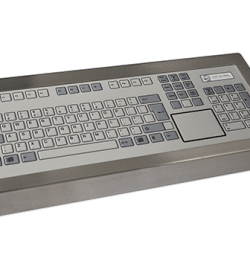 Additionally, our 128T series keyboard has a NEMA 4 sealed enclosure. It prevents dirt, oil, and water from damaging the internal circuit board. Therefore, operators can rest assured that this device will function during the critical operations. Had there ever been in a situation wherein the keyboard button does not respond during critical moments? Are you in need of a reliable peripheral for rugged applications? Then look no further than our 128-key rugged keyboard, with an integrated trackerball. Its ruggedised keys have a life expectancy of 1 million switch cycles which can withstand the heavy operational demands. 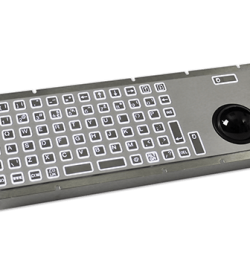 Moreover, our industrial keyboard has an operating force between 160gf ± 50gf. As a result, operators can expect a responsive and accurate device during critical situations. Our device also has features which make it suitable for many industries. Quite often, specialised industrial operations have prolonged working times. During these moments, you can expect that our 128- key ruggedised keyboard functions optimally. Furthermore, it has features which make it ideal for a vast array of industries. Our 128T series keyboard features an integral 50mm (2”) trackerball. This built-in industrial pointing device accurately tracks and virtual pointer. Its phenolic resin material makes it resistant to most liquid chemicals and requires minimal maintenance. The embedded trackerball has an expected 6 million ball revolutions throughout its cycle. So, expect that this pointing device can function optimally for prolonged periods of time. Clients with specialised requirements may opt for custom keyboard language and connections. We can work with you to produce the right industrial-grade computer peripheral device fit for your industry. Ruggedised computers used in industrial operations should have an equally reliable computer peripheral device for industrial applications. This will ensure that operators can take full control of the process during critical situations. So, build a rugged PC using our 128 key rugged industrial keyboards with trackerball today. 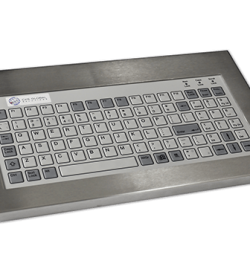 Request a datasheet for FREE of our 128T Series Keyboard or call us at (+44) 01438 747111 for further information.